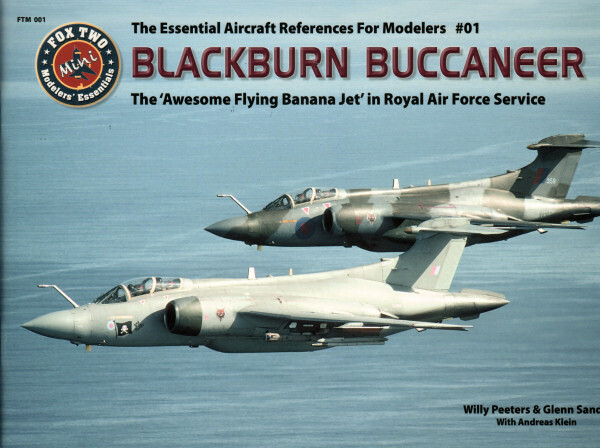 From the same folks that bring you the Ultimate Phantom book series comes a new title and flagship for a new series - this is title covers the Blackburn Buccaneer and is book one in the Fox Two Mini series. You've seen this Willy Peeters' 'Lock-On' and 'Uncovering the...' aircraft monograph series and this title follows those formats. With those up-close detailed photo walk arounds in each title, you might wonder where they could find good examples of the Buccaneer and/or what museum would provide such up-close access to their prized exhibits. In this case, a group at Bruntingthorpe airfield in the UK called TBAG (The Buccaneer Aviation Group) just happen to have two Buccaneer S.2B aircraft (XW544 and XX894) that are not only on display, but are kept in 'fast-taxi' condition (almost flying). The authors have collected a very detailed photo walk around of the S.2B from these aircraft as well as photos of operational examples prior to their retirement. In these 64 pages are crammed over 250 full-color photos providing essential detail information for the modeler and Bucc fan. Coverage also includes the Gulf War era external stores employed by the aircraft as well as a look up into the rotary bomb bay. You're not going to find a better photo reference for the Buccaneer in one place unless you have one in the hangar attached to your home. Now if only Airfix would reissue their 1/48 scale Bucc or someone render this unique aircraft in 1/48th! My sincere thanks to DoubleUgly! Books for this review sample!